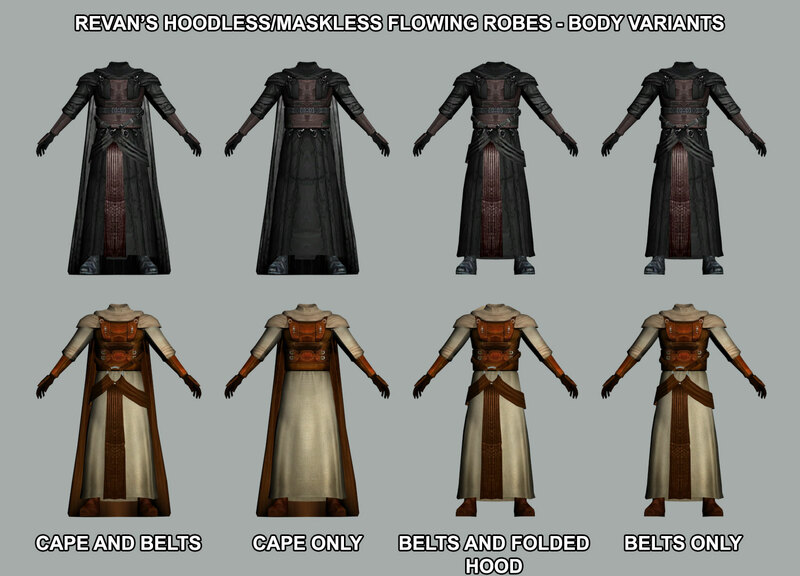 This mod changes the models for the Darth Revan/Star Forge robes to a modified version with the cape and belts seen on the cutscene version of Revan’s robes, but without the raised hood and mask. 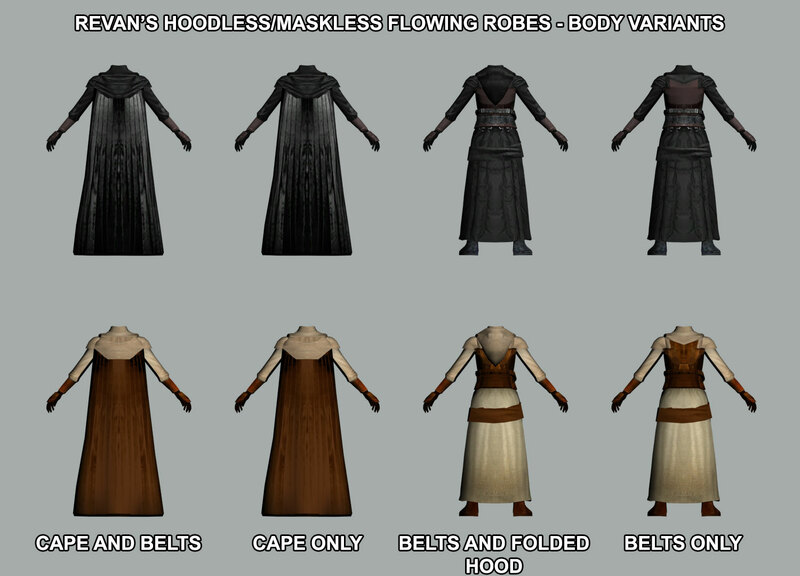 Alternative models with different arrangements of cape/belts/folded hood are available in the mod’s OPTIONAL folder. 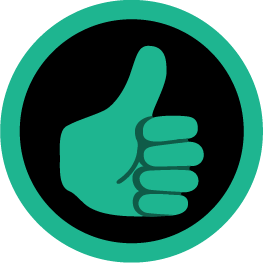 Once you have finished installing the mod, you may copy and paste the MDL/MDXs from relevant folder to the Override folder, overwriting when prompted. Extract n_darthrevan.mdl and n_darthrevan.mdx to your Override folder. 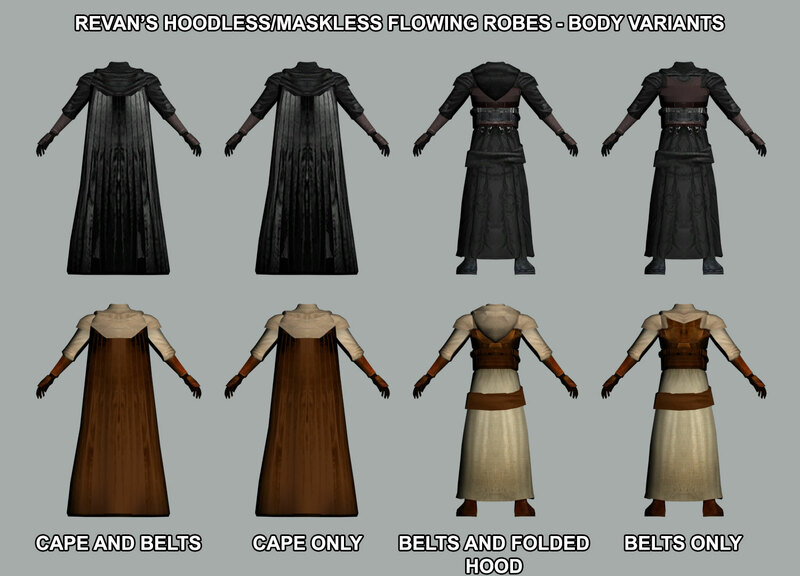 If you do not have this mod then you will not have any animations for the cloak or belts. When Atris captured the Ebon Hawk, amongst the unencrypted data she downloaded from T3's memory core she discovered some interesting information regarding Darth Revan and his robes. 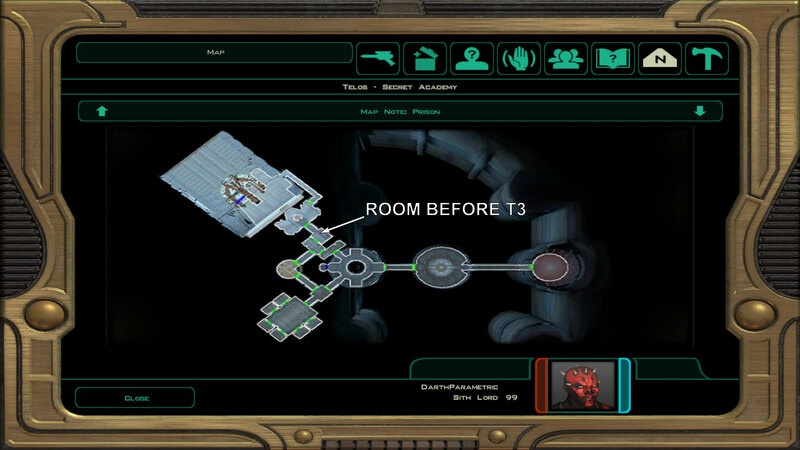 She stored this data for later analysis, turning to the more pressing matter of the Exile's arrival on her doorstep. The male version is a straight replacement for the PMBJ model, so it will not be compatible with any other mod that replaces/modifies that model, or changes the values for that column in appearance.2da. Because of the way animations work, the female version must be set up as a disguise, so it uses its own independent models and appearance.2da rows and is unaffected by changes to the PFBJ model or appearance.2da values. Note, however, that this means it is not compatible with custom female head models. Extract Zimm’s texture from his mod’s tslpatchdata folder, rename it to PMBJ02.tga, and then put it in your Override folder, overwriting when prompted. Make sure you do this after installing the current mod! Additionally, grab the TXI from the OPTIONAL folder and place that in the Override folder as well. There will be some clipping during certain animations. Some of this is related to the animations, some of it the meshes. If you spot something particularly egregious, then let me know in the comments and I may be able to address it if it is model-related. Currently there are no limitations on the generator. 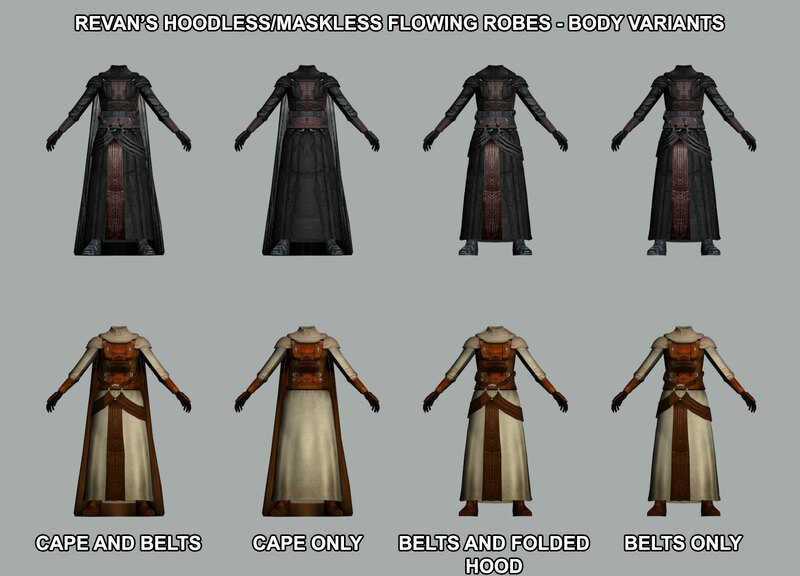 You can fabricate either set of robes regardless of alignment, and you can make as many copies as you like (with the caveat of course that once you leave the academy, you permanently lose access to the fabricator). I may change this in future. 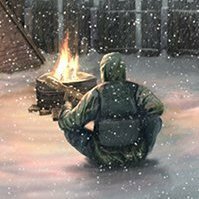 If you are using TSLRCM, or another mod that has added 262tel.mod to your Modules folder, you will get a warning from TSLPatcher that this file already exists and was skipped. This is intended behaviour and not an error. Thanks to Hunters Run for the n_darthrevan flowing robes animations, without which this mod would not be possible. Many thanks to Fair Strides and bead-v for looking over my scripts, fixing/checking for errors and streamlining syntax. Edit: OK, fixed. Thanks for the heads up bead-v.
Wow, so cool, awesome job. This is a seriously well created mod, with an excellent amount of choice that will suit everyone. I love it. You've even pointed to their exact location via map screenshots hahaha! Great job, DP! 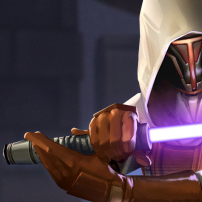 Glad you've given us more model variants for the Star Forge/Revan model.